am·bas·sa·dor [am báss?d?r, am báss? dàwr] (plural am·bas·sa·dors) noun 1. diplomatic representative: a diplomatic official of the highest rank sent by one country as its long-term representative to another 2. official representative: an official representative of an organization or movement visiting this country as an ambassador for a fund dedicated to saving endangered species 3. unofficial representative: somebody or something regarded as an unofficial representative or a symbol of something The swallow is an ambassador of spring. [14th century. 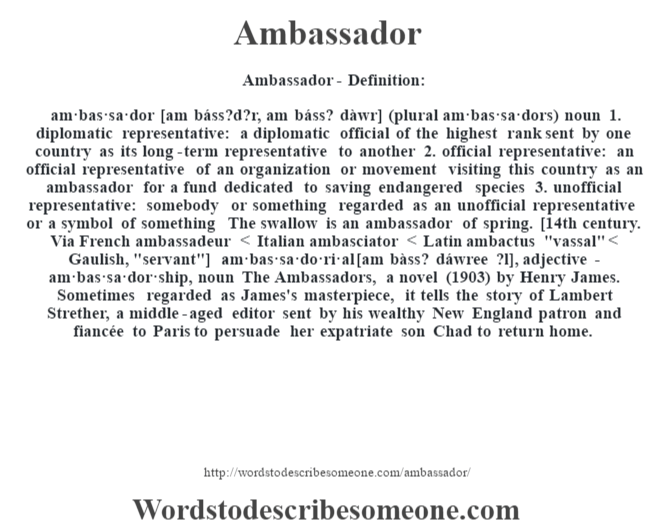 Via French ambassadeur < Italian ambasciator < Latin ambactus "vassal" < Gaulish, "servant"] -am·bas·sa·do·ri·al [am bàss? dáwree ?l], adjective -am·bas·sa·dor·ship, noun The Ambassadors, a novel (1903) by Henry James. Sometimes regarded as James's masterpiece, it tells the story of Lambert Strether, a middle-aged editor sent by his wealthy New England patron and fiancée to Paris to persuade her expatriate son Chad to return home.